Tracy Szerszen, president of PJLA, details a list of the common issues labs should be aware of when preparing for ISO 17025 accreditation. With the cannabis industry growing rapidly, laboratories are adapting to the new market demand for medical cannabis testing in accordance to ISO/IEC 17025. Third-party accreditation bodies, such as Perry Johnson Laboratory Accreditation, Inc. (PJLA), conduct these assessments to determine that laboratories are following relevant medical cannabis testing standard protocols in order to detect potency and contaminant levels in cannabis. Additionally, laboratories are required to implement and maintain a quality management system throughout their facility. Obtaining accreditation is a challenge for laboratories initially going through the process. There are many requirements outlined in the standard that laboratories must adhere to in order to obtain a final certificate of accreditation. Laboratories should evaluate the ISO 17025 standard thoroughly, receive adequate training, implement the standard within their facility and conduct an internal audit in order to prepare for a third-party assessment. Being prepared will ultimately reduce the number of findings detected during the on-site assessment. 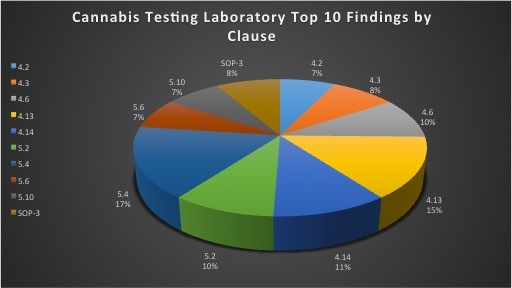 Listed below is research and evidence gathered by PJLA to determine the top ten findings by clause specifically in relation to cannabis testing laboratories. Defined roles and responsibilities of management system and its quality policies, including a structured outline of supporting procedures, requirements of the policy statement and establishment of objectives. Providing evidence of establishing the development, implementation and maintenance of the management system appropriate to the scope of activities and the continuous improvement of its effectiveness. Ensuring the integrity of the management system during planned and implemented changes. Establishing and maintaining procedures to control all documents that form the management system. The review of document approvals, issuance and changes. Maintaining records for the evaluation of suppliers of critical consumables, supplies and services, which affect the quality of laboratory outputs. Establishing and maintaining procedures for identification, collection, indexing, access, filing, storage and disposal of quality and technical records. Providing procedures to protect and back-up records stored electronically and to prevent unauthorized access. Completing and recording corrective actions arising from internal audits in a timely manner, follow-up activities of implementation and verification of effectiveness of corrective actions taken. Providing a training program policies and procedures for an effective training program that is appropriate; identification and review of training needs and the program’s effectiveness to demonstrate competence. Introduction laboratory-developed and non-standard methods and developing procedures prior to implementation. Ensuring that equipment used has the associated measurement uncertainty needed for traceability of measurements to SI units or certified reference materials and completing intermediate checks needed according to a defined procedure and schedules. Not having procedures for safe handling, transport, storage and use of reference standards and materials that prevent contamination or deterioration of its integrity. Test reports not meeting the standard requirements, statements of compliance with accounting for uncertainty, not providing evidence for measurement traceability, inaccurately amending reports. Inappropriate use of PJLA’s logo on the laboratories test reports and/or website. Using the incorrect logo for the testing laboratory or using the logo without prior approval from PJLA. 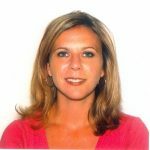 Tracy Szerszen is the president and operations manager of Perry Johnson Laboratory Accreditation (PJLA), a private third-party accreditation body, for the past 11 years and formerly the audit logistics manager for Perry Johnson Registrars, a Quality and Environmental ISO Certification Body, for 6 years. Her primary responsibilities include the direct oversight of the operation, accreditation and sales activities for PJLA. Tracy holds an active role with various memberships within the national and international accreditation community such as ILAC, APLAC, TNI, ACIL and AOAC. She has a General Science and Business Administration degree and has obtained several training certifications in Quality Management standards including ISO 9000 and ISO 17025.